Religious experience is personal and deserves respect. I strongly suggest that you refrain from such inappropriate treatment of Scientology or any other religion or belief. I read the press today about your recent show with Leah Remini who I know will use any opportunity to shamelessly promote herself for money. Having watched the segment, I was especially disappointed by some of the gratuitous comments you made in interviewing Ms. Remini, notably a snarky reference to the Church’s leader as “the big cheese,” and questioning Ms. Remini on why the Church “is not suing” her. Religious experience is personal and deserves respect, no matter what it is. 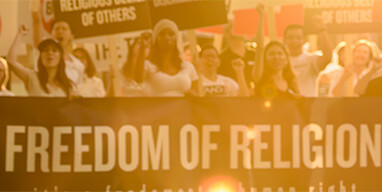 Scientologists are taught to respect the faith of others, and we cherish the religious freedom we all enjoy. We do not believe we or any other religion should be subjected to gratuitous, contrived and, to be blunt, ignorant questions asked of a clearly biased individual who wants to use your show to further her own hate-filled agenda. Shows like your recent one featuring Ms. Remini convey false impressions and promote religious bigotry. Frankly, I’m shocked that you would allow yourself to be part of this. The truth about Scientology is extremely easy to access. Anyone is welcome to enroll in one of our free online Tools for Life courses, available in many languages. Or they can look at scientology.org or go in to a Church and take a self-guided tour of the Public Information Center panels and videos. It is literally that easy. I strongly suggest that you refrain from such inappropriate treatment of Scientology or any other religion or belief. It was not funny and it was not informative. I found it personally offensive and I was embarrassed for you.